In this article we will be looking at word-wrap and what an amazing feature it is. 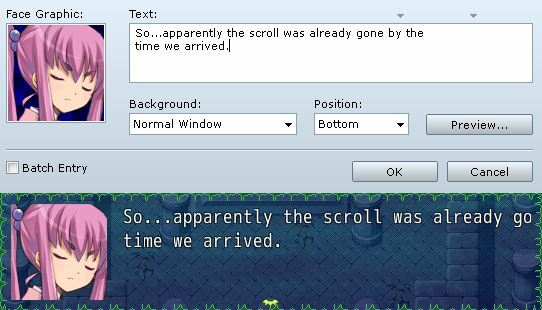 We will discuss word-wrap in RPG Maker and how it can be used, as well as some complications that arise because RPG Maker does not natively come with word-wrap. Wikipedia has a pretty explanation on word wrap. Word-wrap (and line-wrap) are features that determine when a line of text has reached the end of a line that they are displayed on and automatically starts a new line. The purpose of this is to avoid forcing the user to scroll horizontally to view the rest of the line (as in internet browsers), or to avoid having text cut off. The difference between word-wrap and line-wrap is where the line break occurs. For line wrap, it will just print characters out, and once it hits the end of the line, it’ll print the next character on a new line. This may be undesirable because you might be in the middle of a word and now it doesn’t make sense. Some solutions to this include inserting a hyphen to indicate that the word continues on the next line. Sometimes it might even end up on a new page. Word-wrap, on the other hand, will determine that it can’t print the whole word on the same line, and will start the word on the next line. This may be more desirable depending on whether you care whether words are broken apart or not. Not very pretty. Or even correct: we’re missing two-and-a-half words, because the line was too long to fit on one line. A solution? Manually insert line breaks! RPG Maker attempts to help you by providing some visual guidelines. You can see that there are arrows in the show text message editor that indicate when the message will likely be cut off. The first arrow is used if you are showing a face graphic, while the second arrow is used if you don’t have a face graphic. If you’re using larger or smaller fonts, those arrows aren’t very accurate (in fact it doesn’t seem very accurate for the default font either). If you want a larger or smaller window, those arrows won’t help either. The more pressing issue is the assumption that you’re using “plain text”. 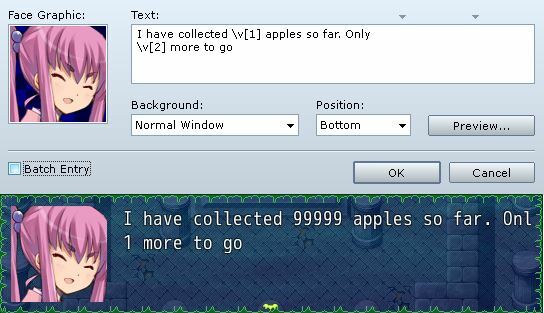 RPG Maker’s message window doesn’t just display text; it comes with a complete set of message codes that do a variety of things from controlling the speed of the text to showing the gold window to replacing certain codes with other values such as a specific actor’s name or a variable’s value. These are called message codes, and it is a very large topic so I will not be covering that in detail here. While it looks fine in the editor, I can’t say the same about the results. If all we had to deal with was regular text, manually breaking your lines might have been a feasible solution, but in general it would be better to have automated wrapping. Because all text is displayed one character at a time, we can start off with an implementation of line-wrap to convince ourselves that it works. We can follow a simple rule: if there’s space on the line, draw it on the same line. If there’s no more space, continue on a new line. The logic is pretty simple: draw the character, increment the x-pos by the width of the character. Rather than simply drawing text, we want to check whether the text can be drawn on the same line first. On the second line, the first character is a space. This is because the space couldn’t be drawn on the previous line. Which is expected, since our simple logic doesn’t care what kind of character we’re looking at. You can sort of fix the second problem but printing out a hyphen before processing the line break, but that’s only if hyphens work for you. Personally, I don’t like using hyphens to work with broken-up words. Instead, I’d prefer to just have the entire word moved onto a new line. We can’t insert our code into the same method, because that is specifically for processing an individual character, and even if we wanted to, we don’t have a reference to the text we are printing out. We move up to the process_character method. Here, we actually have a reference to the remaining text to be parsed. We can perform our word-wrap check by first grabbing all of the characters that are part of the current word and perform our checks on the spot, modifying the position as needed before we actually process the character. We’ll have to ignore word-wrap if we’re working with a message code otherwise strange things may happen (especially since we can add our own message codes). For some, this may seem to be an obvious question. However, it really isn’t. Especially if you start considering other languages. There are also cases where a word should not be broken up, for example someone’s name. But for now let’s consider the very simple (but inaccurate) definition of a word, which is a continuous string of characters without any spaces. Looks better: words aren’t broken apart. Still has those leading spaces though. You probably should be checking whether you’re working with a message code or not though. A new problem appears as a result of inserting new line breaks: what happens when your line is too long and doesn’t fit in the window? Fortunately, the message window already handles this for you: during the line break processing, it also determines whether you need a new page. If you do need a new page, it will pause and wait before continuing. So this solves another problem that we would have had to deal with ourselves. 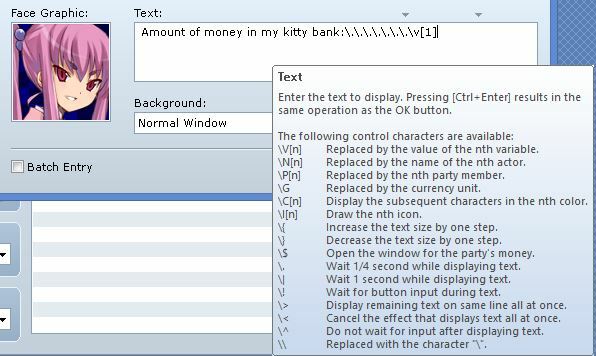 Convert codes are replaced with the appropriate value when the message is displayed, and these are always text values. This is real-time data (at the time of printing), which is an amazing feature that you simply cannot achieve in regular printed literature. Convert codes are replaced in a pre-processing step that occurs before we actually begin printing our text, so by the time word-wrapping becomes relevant, we don’t need to worry about these. Control codes are somewhat more complicated, because they could do anything from simply altering certain behavior of the message drawer, or to draw images. You’d have to consider each one case-by-case. There are a large number of different issues that you can run into when implementing word wrapping. Here are a few. What happens to the existing line breaks in your message when you perform word-wrap. 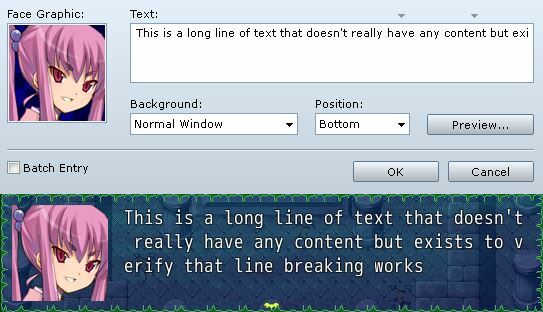 When you press enter in the text box, it automatically creates a line break and will be displayed by the window. One way to address this is to get rid of the original line breaks and let the engine figure out where they should be inserted, but this solution doesn’t work in all cases. Different word wrapping scripts provide their own implementations, such as removing all existing line breaks, but providing a custom line break character that you can use to tell the engine that you actually want a line break. Sometimes you just want to put in a bunch of spaces for some reason. A decision would need to be made here on how spaces would be handled, especially when it comes to line-breaks which may result in leading whitespace. The message window doesn’t only display text. It can display other images as well such as icons or sprites. The existing implementation of word-wrap assumed that you’re working with strictly text, which is not always true. Because there is no standard way of drawing non-text elements, you would need to determine how the image is being drawn, and then use the image’s width in your calculations. So if you’re trying to draw a paragraph with some 200 words, you will see a noticeable delay. Unless you are using scripts that improve the performance of these two methods, I would suggest only using word-wrap for situations where you don’t need to draw too much text, such as the show text message events. Here are some implementations of word-wrapping for RPGMaker VXAce that provide various ways to handle all of the different issues that arise from automatic word wrapping. This is a simple implementation of word wrapping for your message boxes. It only applies to the message window, and no other windows, because the message window is the only window that defines new_line_x. However, if you moved that method up into Window_Base, then you can implement word-wrapping for all windows.